Gelid GC-Extreme thermal compound is the ultimate in heat conductivity and makes the GC-Extreme the leader in the thermal compounds market. Created for Extreme users, the GC-Extreme thermal compound achieves the best heat conductivity possible between your CPU, VGA or even Chipset to your cooler as the GC-Extreme has a more fluid-like consistency than most other thermal pastes. It's low viscosity allows it to be spread more easily and thinly for optimal efficiency. The product comes in two varieties. 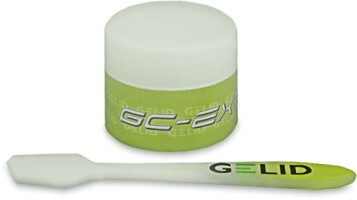 If the GC-Extreme thermal paste is required for many applications then a 10g tub is available. Where only a few uses are required a smaller, 3.5g tube would be a more suitable option. A GELID applicator is supplied which enables an easier, cleaner application of the thermal compound on the processor. Applied to a CPU heatsink alu side surface by spreading with a coffee filter lint free paper with one finger to make it as thin as possible, result is 6 to 7 Degrees lower with a Core2Quad LG 775 socket! My Acer Aspire X3810 miniDesktop is very heat producing; no other solution can solve this issue, after a Noctua NF-A8 fan replacement for my CPU heatsink from this shop, of course! Now, this PC unit is one of the best of its own. Superb performance thermal paste, easy to use, relatively cheap and very effective. The cutting-edge thermal compound... Highly recommended. Very pleased!